I've always been disappointed in "Fairweather Friend". Cale's closing tracks tend to be memorable; this isn't. Cale writes well and often of the disappointments of friendship; this song's title comes from a throwaway lyric. And, of course, it isn't even an original song - it's a Garland Jeffreys cover. (I'm not sure Jeffreys ever recorded a version, though.) But this is my problem, not the song's. It didn't ask for my expectations. Jeffreys is still recording and performing today, but he doesn't seem to do this number. I'm fairly sure Cale has never played it live. I suspect the song is best left an artifact of this particular studio. So: listen to this album when you want light, expansive orchestral pop adventure fun. Enjoy this song for what it is. I do. But someday I hope I find a song like the one I expected the first time I played this record. Caribbean Sunset is another contender for "strangest album". 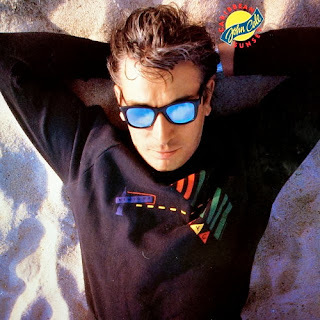 Despite the Jimmy Buffettesque name and hilariously 80s cover (dig that coffee-package album logo, that colorful sweatshirt, and the blue skies reflected in his shades! ), the 1984 album is aggressive, angry, and rather bonkers, much like its predecessor Honi Soit. (How Music for a New Society was born between the two is beyond me.) As on HS, the songs are angry and threatening even when (I think) they're trying to be upbeat. Caribbean Sunset also fits neatly into the possibly nonexistent category of music known as "Spy Rock", described very memorably (though I think much too loosely) at John Hodgman's and Jonathan Coulton's Little Grey Book Lecture Series by a gentleman named David Guion. (Listen to podcast number 2 here. I promise it's worth the time.) Despite earlier ventures into the pseudo-genre ("Sudden Death", "Leaving It Up to You", "Fear", maybe even "Endless Plain of Fortune" or "Ghost Story"), Cale's work really swung that way in the Reagan years. From his live shows in '78 all the way through Artificial Intelligence, you can practically smell Foreign Affairs on his breath. I haven't decided yet whether or not this anger and menace is a liability. Album opener "Hungry for Love" is a rather slight thing, an exhortation to, um, love more...? Specifically, to love Mr. Cale more. He promises to reciprocate. But the arrangement and especially the vocal delivery make me wonder; listening to his performance feels like being browbeaten, not seduced or consoled. Especially on the bridges. "You can walk on water 'cause you're feeling strong. You can walk, you can walk on water. That's what women know!" is one. "You can see the writing, it's on the wall. You can see the writing, it's ten foot tall!" is the other. I don't hear anything but anger and resentment in the vocals. "Writing on the wall" is, from its biblical origins to the present day, not really a good sign. The band sounds good, though very straitlaced slightly-punky conventional rock. The composition is rather catchy, with a mirrored piano figure as the main hook. It doesn't suffer horribly from digital recording. It's maybe a bit compressed, but maybe that's an artifact of the vinyl rip I have. The dissonant piano and the one-note guitar solo near the end add even more tension and fear to this romantic little ditty, so it's not just the vocal. There's an unusual accent in the backing vocals on the coda... that couldn't be Nico, could it? There's just an irresolvable tension between what the song claims to be and what the band actually recorded. But, you know, it actually makes for more interesting listening. Here's a well-made cover of the song that delivers more accurately on the emotions promised by the song's lyrics and melody. Do you think it's better? Mr. Cale has always had an eclectic taste in covers (Axton/Durden/Presley's "Heartbreak Hotel", Jonathan Richman's "Pablo Picasso", Brian Wilson's "God Only Knows", Ralph Vaughn Williams's "Let All Mortal Flesh Keep Silence", and so on), so it shouldn't be too surprising that he covered Chuck Berry's legendarily expectation-upsetting "Memphis, Tennessee". It's not one of his most illuminating covers - despite a lot of rearrangement, the overall effect is pretty close to the original. The vocal is bullish, sanding off most of the emotional details, and is probably the weakest link in the song. There's a little bit of everything in the mix and the instrumental parts are continually changing through the song, but I'm not sure that makes it better listening. The hornet-swarm guitar and viola solos, recalling Fear's "Barracuda", are striking and the best reasons for listening. Overall not essential, but worth a listen now and again. What is surprising about the song is its context. It may sound like an Island Years outtake, but it occupies the second a-side slot in 1977's ultra-bizarre Animal Justice EP, after punkish Croydon Chicken Incident souvenir "Chickenshit". The b-side is "Hedda Gabler". The Cale discography is full of odd records, but I'm pretty sure this one's the strangest. Speaking of strange: here, watch a Czech Cale cover band (!!!) cover JC's arrangement. Amazing job, but somebody get this poor man a lyric sheet. Another Music for a New Society cut, you say? Yes, yes. Bear with me. I've been thinking about it a lot for reasons that will soon become obvious. Probably the simplest, sparest track on the album, "If You Were Still Around" packs one of the strongest punches even so. There's hardly any music to speak of: The drum machine at the edges of perception, barely more than a metronome. The organ, nothing but a few chords with some very sparing accents, offering a scale climb where the middle eight should be that serves as the song's only ornamentation. No harpsichord, ghostly electric guitar, electric piano, viola, electronics. And then there's the vocal. Not the most sober of the album - that's "Close Watch". Not the most carefully expressed - that's "Taking Your Life in Your Hands". But perhaps the one that most carefully keeps to the edge between performance and exorcism, mimicking the underlying tension of the whole album. And the control on display here amplifies instead of soothing the tension. The lyrics, a contribution from Sam Shepard, seem unusually clear. Addressed to a friend lost to self-destruction, marinating in powerlessness and frustration, they bargain with the lost. The images of cradling and of resuscitation of the first verse, slipping into recollection of the self-harm: "You could ride, like a panther, whatever got into your veins. What kind of green blood swum you to your doom." The most arresting moment, confronting lost opportunities to help: "If you were still around, I'd tear into your fear, leave it hanging off you in long streamers, shreds of dread." And finally giving way to voodooistic avenues for resurrection: "If you were still around, I'd turn you facing the wind, bend your spine on my knee, chew the back of your head till you opened your mouth to this life." So it may not be very uplifting, but on THIS album it's one of the more heartening and life-affirming tracks.